It has been over ten years since the mind behind Mario, Donkey Kong, and Zelda, Shigeru Miyamoto, used his passion and new hobby of gardening as the inspiration for the GameCube near-launch, real-time strategy title Pikmin. The game would receive a much desired sequel later on in the system's life, but this go around the time constraints of the original were removed. On the Wii, Nintendo has gone back to its GameCube catalog to port several classics onto their motion-controlled system with all-new Wii methods of input in a series called New Play Control. 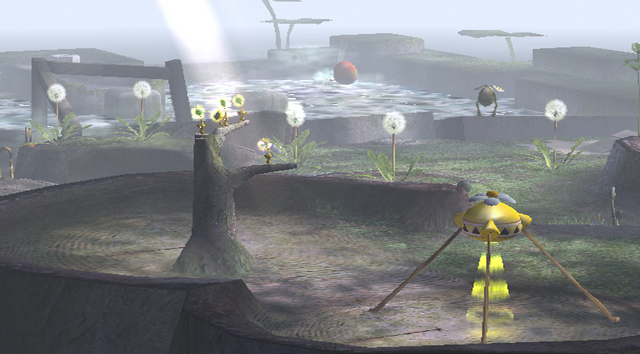 The original Pikmin was one of the these, but while Europe received the second game, North Americans have had to wait three long years for the game. Well, Nintendo of America has finally released Pikmin 2 for Wii to get gamers' appetites whetted for the upcoming Wii U's Pikmin 3. And considering how expensive even used copies of the GameCube version of Pikmin 2 are, this pointer-controlled iteration is a steal. While Captain Olimar was on his "vacation" in Pikmin 1 (a crash landing on an unknown planet full of hostile creatures is hardly what I would call vacation time), his shipping company was free-falling into debt. When Olimar arrives back on his home planet, his boss informs him of the grim fate threatening the company. It turns out Olimar's ship, the Dolphin, can value certain acquisitions. The various treasures that are found by Olimar and new partner Louie and then appraised by the Dolphin can slowly but surely knock down the amount of debt their employer possesses. Back to the planet upon which Olimar had previously crash landed on to score some treasure! Of course, Olimar and Louie need not accomplish this task by themselves. As they explore the planet they get reacquainted with the Pikmin creatures Olimar had met before. Even after the 10,000 Poko debt has been repaid, the adventure still isn't over. The goal of Pikmin 2 is to accumulate enough money to pay off Hocotate Shipping Company's debt. How this is done is by finding various treasures (funnily enough, real life objects like Duracel batteries, Nintendo's Game and Watch handheld system, Chapstick, and other worldly items) lying about among the four lands of the game while dispatching Olimar and Louie's Pikmin to defeat enemies and stow the goodies back to Olimar's ship. While the day limit of the original Pikmin is gone, there is still the matter of the day cycle. It is essentially a 15 minute period of time beginning with the start of the day and ending with the sun setting. The planet is highly hazardous to one's livelihood at night, so Olimar, Louie, and their plethora of Pikmin must escape before night falls. If any Pikmin are left behind, they will suffer the grisly fate of being gulped up by the nighttime lifeforms. 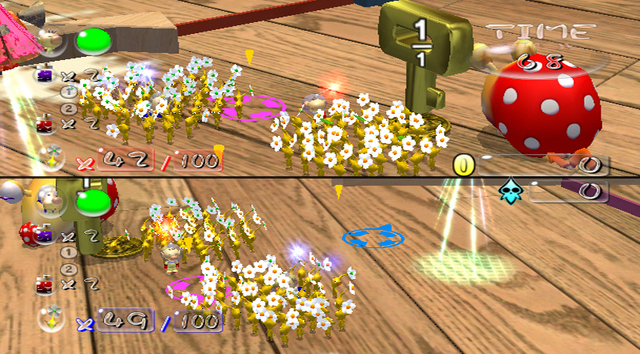 At the beginning of the game, both astronauts have a paltry amount of Pikmin to use. By killing belligerent baddies and using the Pikmin horde to carry their carcasses back to the Pikmin's own various Onion vessels, as well as taking colored pellets plucked from flowers around the various lands to these previously mentioned Pikmin ships, more Pikmin will be generated for Olimar and Louie to pick from the ground. There can only be 100 Pikmin on the ground at once, so choosing the right balance of Pikmin types is key to get the most amount of work done in the least amount of time. This time there are five varieties of Pikmin for Captain Olimar and Louie to befriend and utilize to assist them on their treasure hunting exploits. 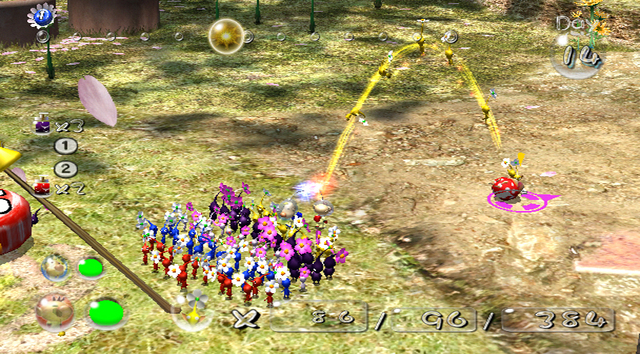 The three primary Pikmin types from the first game return: red, yellow, and blue. 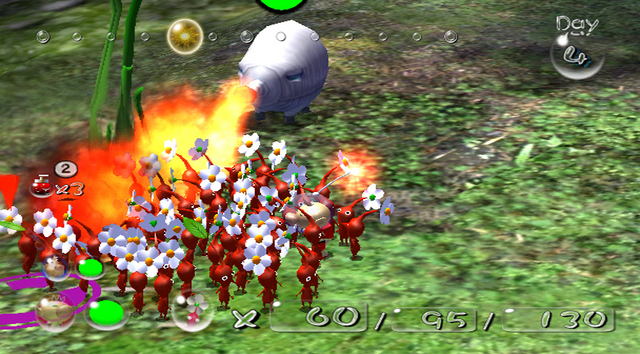 Red Pikmin are great attackers as well as being fire-resistant. This means they can handle certain enemies who breathe scorching flames without a problem, and they can destroy geysers that spew flames that would otherwise set the remaining Pikmin types ablaze. Yellow Pikmin are more lightweight, meaning they can be thrown to higher areas. They also are immune to electricity, making them perfect to dispose of shocking foes and bringing down high voltage gates that no other Pikmin type could manage without perishing. Blue Pikmin are the only kind to be able to walk in water without drowning. Now that the old kind of Pikmin have been explained, time for the new. There are two new types that are only found underground through tossing preexisting Pikmin into either purple or white flowers. Purple Pikmin are the strongest variety around. One Purple Pikmin also weighs ten times as much as one normal Pikmin. White Pikmin are thin as can be, but their appearance shouldn't be taken lightly. They are unaffected by harmful toxins as they are themselves poisonous. In fact, if they are gobbled up by a foe (oh, the horror! ), the enemy that consumed them will slowly lose health from having eaten their poisoned prey. White Pikmin are also expert diggers. They excel at finding treasure hidden and buried beneath the soil. The New Play Control controls of Pikmin 2 work rather well. While you aren't using any gestures for control inputs, you will be utilizing the Wii remote's pointer to aim at where you wish to chuck your numerous Pikmin. What's great and convenient about this-- and something that would be impossible with the GameCube controller-- is that you can point at Pikmin (say ones that are at the edge of the screen) that would have otherwise been out of your range and call them back to you. In the GameCube version, you would have to run all the way back to where the idle Pikmin were standing just to round them back up. This is the convenience of the Wii remote's pointer in action. Pikmin 2 on Wii puts in practice the Wii remote and nunchuk. All of the buttons that were dedicated to specific orders on the GameCube controller are emulated via the Wii remote and nunchuk combination. From tossing Pikmin to dismissing them into separate groups, to switching between Louie and Olimar, to calling Pikmin to your side, every input is here at your disposal. Speaking of Louie and Olimar, most of the time the two need not work together to do well, but proficient players will divide tasks up between the two for the best amount of efficiency. While one gets his group of Pikmin to tear down a gate, the other orders his Pikmin ranks to build a bridge to cross otherwise inhospitable waters. Sometimes you will be forced to switch between the two in order to approach, in different circumstances, impossible to reach areas. 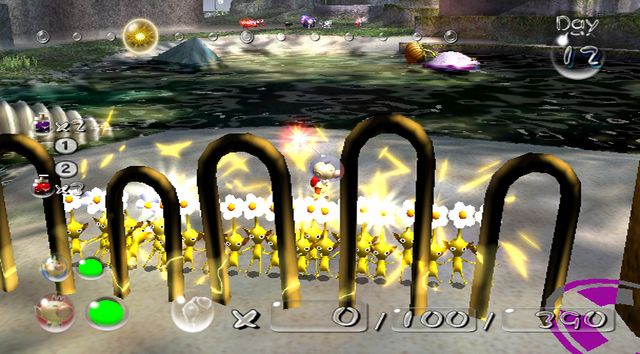 This occurs in the second area of the game, Awakening Wood, where either Olimar or Louie must stand on one block while the other tosses Pikmin onto the other block which is protruding upwards. The weight of the Pikmin on the one block causes the block the other astronaut is on to rise, allowing him to chuck Pikmin up towards a treasure that would have been otherwise impossible to reach. Apart from the four main areas of the game, taking place across winter wonderlands and rugged mountainous valleys, are subterranean holes. These are the most dangerous and challenging places in the game. In these you only have the Pikmin you bring in with you to survive with no hope of spawning new ones while you are deep inside. Time doesn't pass in these areas, and some span 10+ floors. Most conclude with a perilous boss confrontation. I'm talking about giant spiders, obese insects that roll over to squash your adorable combat partners, and snake-like birds that have no quarrels with chomping down on your Pikmin pals. Each floor contains various treasures, usually more than one per floor. The Treasure Gauge, an item that is recovered through normal play, will tell you if you have salvaged all of the items on a given floor. The catch to treasure hunting in the numerous subterranean caves of Pikmin 2 is that if you surrender and retreat from a cave without escaping from a geyser, all the treasure you collected will be put back. For the caves with a seemingly infinite amount of sublevels, the strategy when you reach an exit geyser is critical. Do you continue down the rabbit hole, knowing that the dangers below will be even more difficult as you move on, or do you take what treasures you have now and retreat to the surface, better to be safe than sorry? Aside from the decent-length single player story mode, there is multiplayer as well as other modes. Two players can battle via split-screen in a contest to collect their opponent's marble or to gather four yellow marbles before their opponent can. There is also a Challenge Mode, unlocked through playing the solo game, which has you and your limited number of Pikmin retrieving keys (as well as treasures) to access the next subfloor. You only have an assigned amount of time to reach the goal, but at the same time you want to collect as much treasure as possible to get a high score. Pikmin 2 was ported directly from the GameCube, so all assets and the like are the exact same on the Wii. By far the star of the presentation is the framerate which generally stays locked and solid even if 100 Pikmin and a menagerie of menacing adversaries are hanging around. Enemy characters look pleasant as does the crystal clear water, especially as you and your Pikmin cohorts waft through it. What isn't so pleasant are the ground textures. If you zoom the camera up close (the camera can be zoomed in and out via the d-pad's left direction), you can easily see the unappealing muddy textures. Moving on from visuals, the sound design is lovely. The quaint music and fanfares are alluring and the cheers and cries of Pikmin are both adorable and disturbing, more so when they are being devoured in front of your eyes. North Americans like me might have had to wait three more years than the rest of the world (I won't say the wait was worth it), but it's terrific to finally be able to play Pikmin 2 with pointer controls. Whether they are better than the GameCube controls is an argument that will have no clear winner. I find the Wii controls more convenient (tremendous for calling faraway Pikmin without having to walk across the screen to reach them) and comfortable to use (allowing my hands to not be bound together on a dual analog controller is freeing). At twenty dollars and with used copies of the GameCube game going online for so much more, this Wii edition is a fantastic buy. It is certainly the type of game that will "pik" your interests.